Looking for something to brighten up a boring wall in your home? 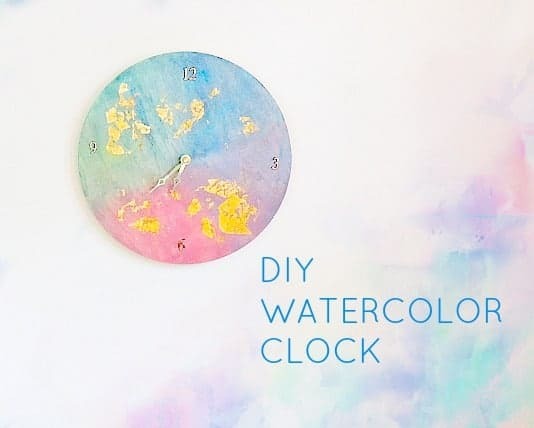 This fun DIY watercolor clock might be just what you need! Are you thinking what I was thinking at the time? Two birds with one stone? Yes, please! I took my (waddling) pregnant behind over to AC Moore to find supplies to build a DIY clock. I picked up a pre-drilled circular clock face and a clock kit. I also ended up finding a whole set of watercolors for $5. I love working with watercolors (and not so much acrylics like Virginia used) so I went with those. And of course I picked up some gold leaf too. I’m on a huge gold kick these days and I’m loving adding gold accents all over my home! With a 40% off coupon plus my teacher discount (an additional 15%) everything came to $13. The great thing about working with watercolors is that there’s really no way to screw up. Pick the colors you like, start by wetting the surface with some water and then apply the paint! You really only need a teeny tiny bit of paint as it goes a long way. The colors will blend into each other and give you a really nice effect. I have a lot of blues and and greens in my living room so I chose those as the main colors to work with. You should choose whatever floats your boat and makes you happy :-) There’s no rules here! Once it was dry I attached the clock kit as per the directions. Then I applied some gold leaf. Again, don’t be afraid of gold leaf. You don’t need any fancy adhesive – modge podge or Elmer’s glue works perfectly well. Put some glue down on the surface, place the gold leaf down and pat it in place with a foam brush or paint brush. Just do it in a random, abstract way. Seal it down with more glue or modge podge. Once it’s all dry all that’s left to do is hang it up! This was such a fun little project to do and could possibly be my new obsession. I might even been brave enough to make a larger (non-clock) version on canvas next time! This is awesome! It has all of my favorite things. Watercolor, gold leaf, and wood grain! 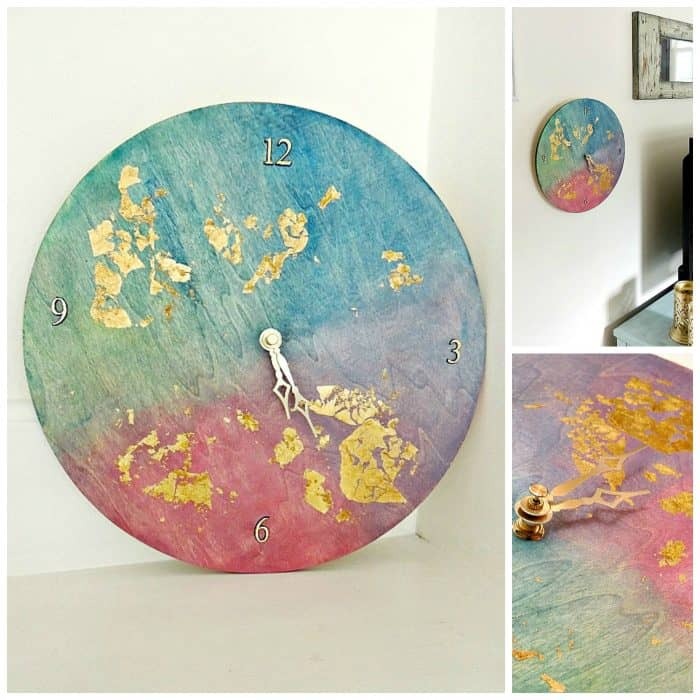 I have a clock face that I am going to redo and I might have to try this technique. Thanks for sharing. Pinned!! 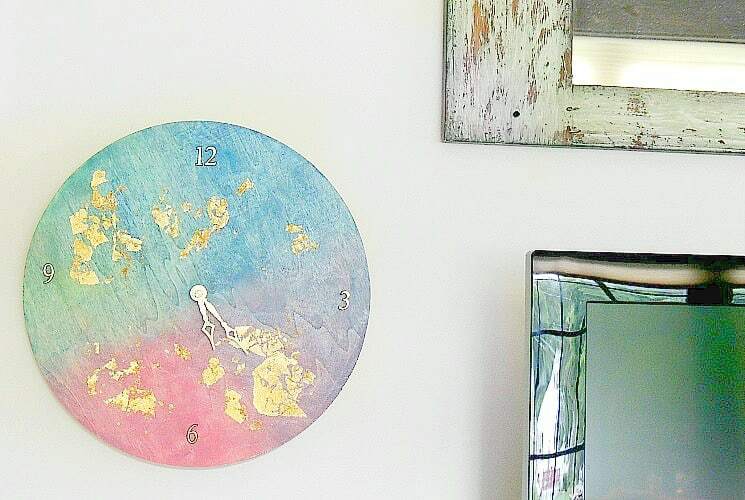 Not even really into crafty stuff, but this clock is awesome. Wonder if you could make a cool manly version… maybe just use different colors?